Waves of Creativity: Whitby Abbey again!! 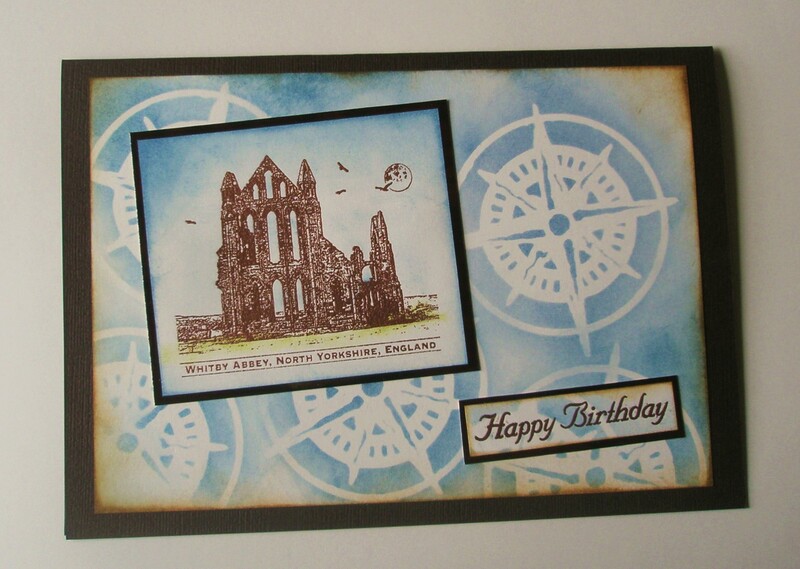 Yes, I know this is the third recent post featuring the Crafty Individuals Whitby Abbey stamp CI227 but this birthday card for my dad is the reason I bought it. My family history research has got back to the 1680s in the Yorkshire Wolds and then the 1700s in Whitby and Fylingdales. So when I saw this stamp I knew I had to buy it!! 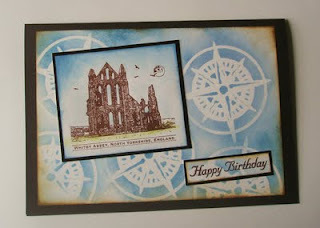 I've embossed Whitby Abbey in copper and then tinted it with Shabby Shutters and Stormy Sky Distress inks. I've used Tim Holtz's compass mask on the background and blended over it with Stormy Sky and Vintage Photo. It's for these sort of cards I'm looking for a map stamp - one that doesn't feature the Pacific Ocean!! Anyone know of any UK map stamps?? Please let me know if you do. Anyway I'm hoping my dad will like his card and has a happy birthday.